It's been a quiet week, but it's a busy one this week. Wednesday is the last night at The North Pier, so I'd like to take this opportunity to thank everyone concerned for all their hard work throughout the summer and onwards. I can also tell you that I have agreed to do another "Comedians" show on the Central Pier, Blackpool on 7th November. After the show on Wednesday, Myself, Tony Jo, Jonny Casson and Maurice Grumbleweed go straight to the airport and fly to Benidorm for a one off show. We then fly straight back on Friday morning and I go to Harrogate for a show with Johnny Casson and Stan Boardman. Then it's back home for a rest! It's been a strange week. I was on a cruise ship, but for reasons which I won't go into detail, I didn't get back home until Friday. I missed the Wednesday night on the pier and a gig on Thursday, so to all those involved, sorry, but it was out of my hands. I got back into Gatwick on Friday afternoon and went straight to the Isle of Wight. I was topping the bill on a comedy weekend at a holiday park near Bembridge. So it made sense to go there on Friday and travel straight back to Blackpool after the show. Thanks to Eloise and her team for looking after us and making us feel so welcome. The mad dash to catch the midnight ferry is something to behold, every act who has been working on the island is trying to catch it, because if you miss it, the next one isn't until 2.00am. Transit vans with bands in them all speed towards the port, it's funny to see. Anyway, I'm absolutely Knackered, so I'm going to bed to catch up on lost sleep. I can't believe it's almost October. It only seems like 5 minutes since we started the "Summer Season" show at The North Pier (Blackpool). I used to enjoy a leisurely stroll down the pier in the evening sunshine, but now I just get blown down there. It amazes me that people come down there to see a show, but they do. I always go into the Theatre bar after the show to meet the audience. I love chatting with everyone, and meet some really nice people. Everyone comments on how much they have enjoyed the show. I have to say, it's fun to do, and all the cast love doing it. I missed one show this month due to a prior commitment. This was a cruise ship, which I joined in Talin. If nothing else, this job does help your knowledge of geography. I had a great cabin, and used my time on board to relax and catch up with some films. Then it was straight back to the pier, and then on to a "Civic' do at "Barnsley Metrodome." I did offer to put the Mayor's Gold Chain of Office into one of those bags, and send it off to get some "Cash for Gold!" I thought we could share it, but he wasn't having any of it. When times are hard, you've got to look for opportunities! I have also recorded an interview with my mate, Johnny Vegas, for a Radio 4 documentry about comedy and the comedians who work in Benidorm. It goes out in November. On that note, I'm away on another cruise ship on Thursday, so I will have to Sky Plus the new series of Benidorm on Friday. This has to be the funniest thing on TV at the moment. I hate going to funerals, I get so upset, especially when the person that has passed away was a close friend. On Friday, it was Neville King's funeral. I have sung his praises before. He was a wonderful man and a great entertainer, not to mention, a close friend. I was asked to speak at his funeral, but felt that I wouldn't be able to do that, because I was too upset over his death. So I agreed to say a few words and do a bit of comedy for his family and friends at the Village Hall after the service. The funeral turned out to be a wonderful celebration of his life, with everyone singing old songs and musicians playing his favorite tunes. Johnny Casson told a few stories about Neville, and Bernie Clifton made an emotional speech. Tributes from Ken Dodd, Norman Collier and Jimmy Tarbuck were read out. Neville was then buried in the village cemetery, beneath a beautiful tree. Everyone then went to the Village Hall, where we could have a drink and talk about our memories of Neville. I then got up and did a short comedy set, which was requested by Neville's wife, Joanie. We all had a good laugh, just as he had wanted. It was a sad, but wonderful day and a fitting tribute to a fantastic man. I, along with many people, will never forget him. On a lighter note, I am flying to Italy today to do a show on board The "Legend of The Seas". I then get straight off and fly back to the UK. So I'm doing a cruise that doesn't go anywhere! You know me and my fear of flying, well it would have been better if the plane didn't move, but the ship did!!!!! I'm not that lucky though. The Bank Holiday weekend is here, where has the Summer gone. We had a show near Paignton on Friday evening, so, because of the Bank Holiday traffic, we decided to travel down on Thursday. My mate, Bill, owns a Pub with a hotel in Ivybridge, it's called The Sportsmans Inn. We rang him to say we would be in the area on Thursday evening and were booked into his hotel without even asking! Here's the thing, he was having a wine tasting evening in the pub, and we were invited. We had a great night, and I even got up and did a short 10 minute set. But I had a sensible head on as I had to work the next day. Steve enjoyed more of the wine than I did, in fact he enjoyed most of my wine as well as his!!!!! It was nice to see some of our friends that we know from that area, including Martin, who is an Insurance Man and a part time Comedian. He tells us all that his act is mainly 1970's Knob Gags, he's not lying! Friday saw us at a holiday park in Totnes near Paignton. 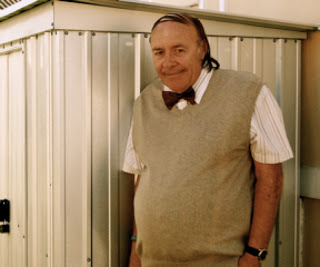 We were doing the show for an old friend, Dickie Mellor, who is an act, but he's turned into a "Caravan Salesman." The park he works on is stunning, with a mixture of Static Caravans and Lodges. I had a bit of fun with all the owners during the show. I kept calling the Lodges, "Sheds." They took it all in fun, and we had a fun evening. I have to say that the Lodges were fantastic. The one we had was luxurious and even had a hot tub on the patio. Saturday saw us at "Warners" Holm Lacey Hotel, near Hereford. We drove back to Blackpool straight after the show. I'm at another Holiday Park near Blackpool tonight, and back on the Pier on Wednesday. My great friend, Neville King, has passed away during the night. He was one of the worlds best ventriloquists, who was always on TV during the 70's. He took me under his wing when I did my first "Summer Season." He taught me so much about performing on a bigger stage. I will never forget him. My thoughts are with his wife, Joan, and his family. For those of you who haven't seen Neville doing his thing, here's a link to a You Tube clip. just copy and paste this into your address bar and enjoy. I've just got back from the ship. I have to tell you this. After leaving Southampton and spending 2 days at sea, we arrived in Lerwick. It looked nice, with typical Scotish style countryside. So I decided to go ashore and find a nice bottle of "Quality" Scotch Whiskey. On leaving the ship, I asked where to go to find what I wanted, and expected to be told of a local shop selling local produce. Instead, I was directed to the local Co Op! I couldn't wait to get to the Faroe Islands to see if the had an Aldi. The ship was nice, and I met some lovely people. The actor, Gary Webbster, who used to be in "Minder" was on board, he was giving talks. I enjoyed his company, and he told me some great stories, but some of them must remain confidential, but they were funny. I got back into Heathrow on Tuesday evening, and was back on the pier last night. Audiences are good, and I'm enjoying myself. If you come along, please come up after the show for a chat, I don't bite. I'm on the way to Southampton to join the P & O cruise ship, "The Artemis." We will be sailing up to Iceland, where I will fly back from Reykjavik. I've been there before, and it is a fantastic place, but it's very very expensive. On the way up there, we will be stopping at Lerwick and Torshavn in the Faroe Islands. When I told the missus, this, she said, "Oh, What will the weather be like in Egypt?" She thought I was going to the Islands where the Pharaoh's came from!!!!! Still, where would I be without her. What a weekend, as you know, I was in Spain for the Johnny Vegas DVD shoot. It gave me a chance to catch up with a few friends who live out there. Thanks to everyone who made both Steve and I so welcome. We had a long day on Monday. After leaving Johnny and co very late in the morning, we managed a couple of hours sleep, and then went to the airport to catch a flight back to The UK. We then went straight to the Isle of Sheppy for filming. This was for a pilot for a potential new TV series. Here's a sneak preview of my character. 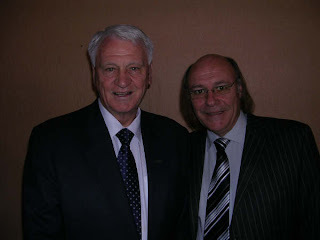 I was away in Spain when I heard the sad news about the great Sir Bobby Robson. I had the pleasure of working with him several times. As a former pro football player and also as a football fan, I was saddened to hear of his death. I have my own memories of him. He was a gentleman and a true proffesional, who loved what he did.